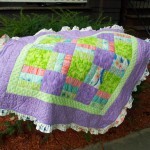 I have the need to make a couple of baby quilts for friends and family in the coming months. This is the first, which started as me wanting to play with a few new things and ended up as a finished quilt that I’m pretty happy with. 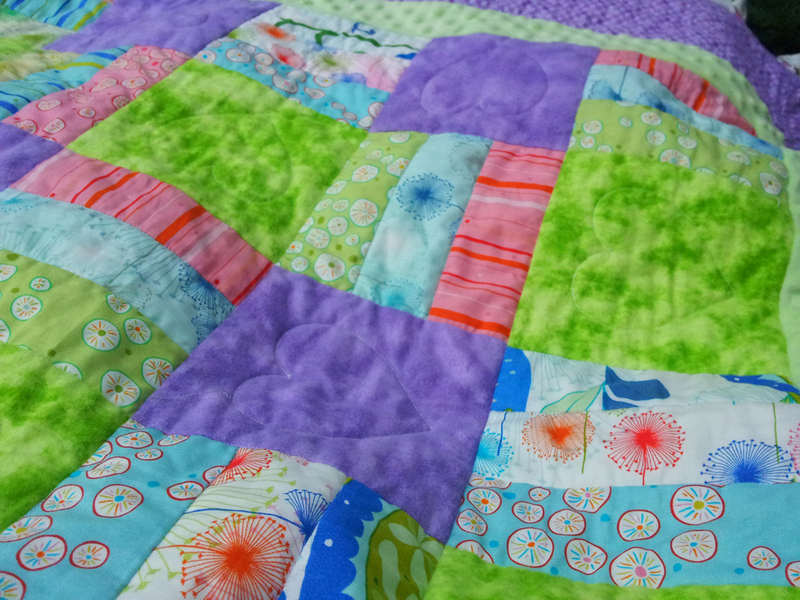 It was also very quick—the binding took longer than the rest of the quilt, I think. I started with a designer roll of Wrenly (Valorie Wells), but ended up only using nine strips in the quilt itself. The marbled fabrics are flannels, the thin border is Minky, and the outer border is something I picked up from the sale bin at the LQS. I wanted to try using Minky as a quilt backing, and everything I read said that close quilting is not recommended, so I stitched it all in the ditch. Because I used an 80/20 batting that recommended quilting closer than 4″ I also had to do something in the flannel blocks. 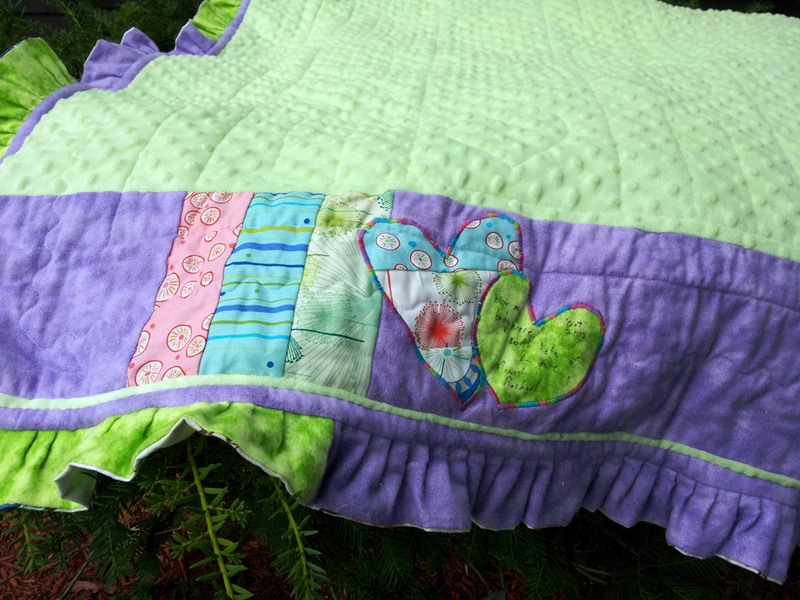 I ended up using the embroidery feature of my machine to quilt hearts in each one (facing away from center, so there’s no real top or bottom). I didn’t even do anything different when I sandwiched—just spray basted, put some pins in (maybe every 6″? I don’t trust the spray on its own, but I hate pinning. I find the combo works awesome), and quilted away. The ruffled edge idea came from having a ton of spare strips from the roll, and a ruffler foot that I’d never used. I finished the edge by sewing flannel strips to the roll strips, then turning it to the back and ruffling them as one. 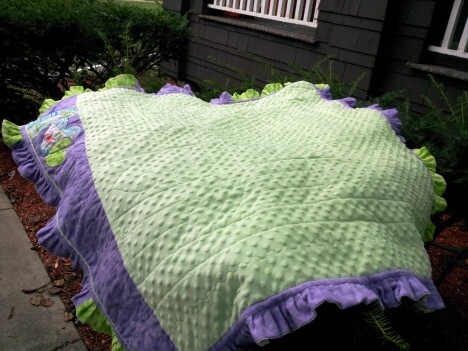 I attached it in an unorthodox way: by sewing 1″ strips to the front and back of the ruffle, then attaching it much like you would double-fold binding. I didn’t trust myself trying to do a knife edge with the Minky. I’m not sure I’ve found the perfect measurements yet, but I’ll explain how to do it soon. 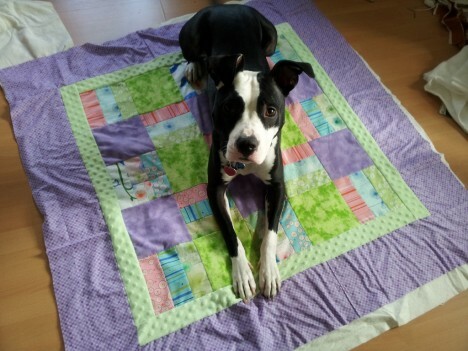 I have another quilt to do it on, too. I did learn that the strips attached to the ruffle really do need to be on bias. I cut them on-grain, mostly because I was running out of fabric (I had about an inch and a half strip left once I cut what I needed), but the curved corners curl up a bit as a result. But the real proof was when I draped it over the couch for a (failed) photo shoot, he immediately jumped up on it like “Hey, that’s my favorite quilt to lay on!”—which goes to show how excited he was, because he knows he’s not allowed on the couch. 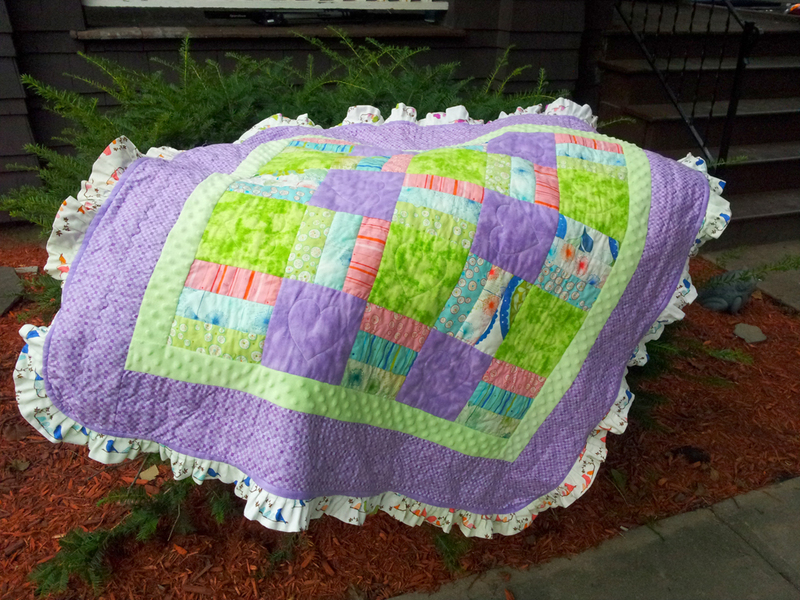 I hope my baby niece likes it just as much, when she comes around in October!